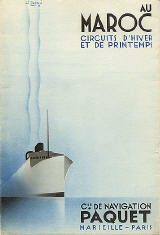 Travel brochure "L'Amerique du Sud par Marseille," 1929. Signed "Cristofanetti." 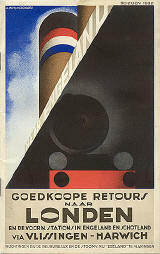 Travel brochure "Goedkoope Retours Naar Londen," 1932. Published by "Lissone-Lindeman." By A. M. Cassandre. 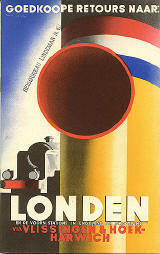 Travel brochure "Goedkoope Retours Naar Londen," 1938. 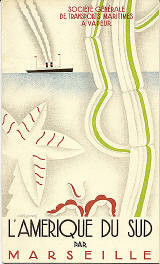 Signed "Kass van der Loon." 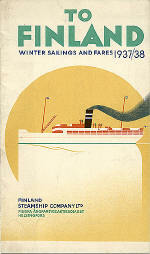 Travel brochure "To Finland - Winter Sailings and Fares 1937/38." Travel brochure "Au Maroc - Circuits d'Hiver et de Printemps," 1932. Signed "Tonelli." 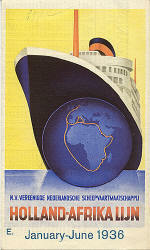 Travel brochure "Holland-Afrika Lijn - Passenger Tariff and General Information," 1936. Signed "Mottes." Timetable "Holland-Afrika Lijn," 1936. Unsigned. 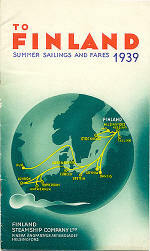 Travel brochure "To Finland - Winter Sailings and Fares 1939."